I've bemoaned the lack of originality in valve amps more than once in this august publication. It seems odd that the majority of the better valve amps are based around 50+ year-old valves and circuits. Perhaps there was a 'golden age' when perfection was attained, but that the 300a/b valve should be widely seen as the greatest of them all, a valve designed in 1933, is just a little disappointing. This pedigree was why I so wanted to play with one of their designs, and to my great delight a very large and heavy box arrived on my doorstep on the day promised (top marks for that for a start!). The amplifier I decided to review was the new Crossfire. There were several reasons - it's the cheapest model that showcases Ayons top AA62B power tube, it's price was not a million miles away from the majority of 300b amps I've had here, and I was quite keen to see how such an amp stacked up against my own Audionote M3 preamp (circa 7000 Euro), and Opera 300b PSE monoblocks (ditto), a combination that cost considerably more than the Ayon's 8500 Euro. And that feeling continued because the Crossfire is a very beautiful piece of kit. It looks very different to the wood and alloy delights of my gorgeous Opera amps, but in it's own way - all black anodized alloy and those huge transformer covers - it looks as good. 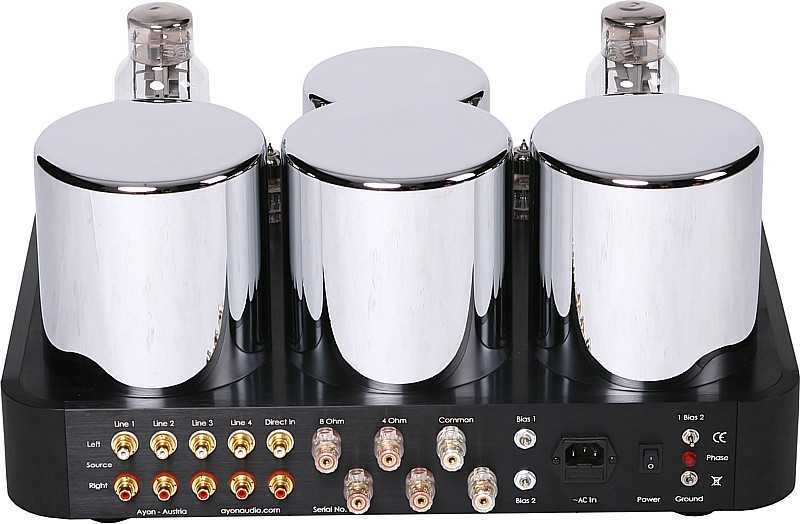 This is an expensive amplifier, but it looks the part and in my book that's important too. 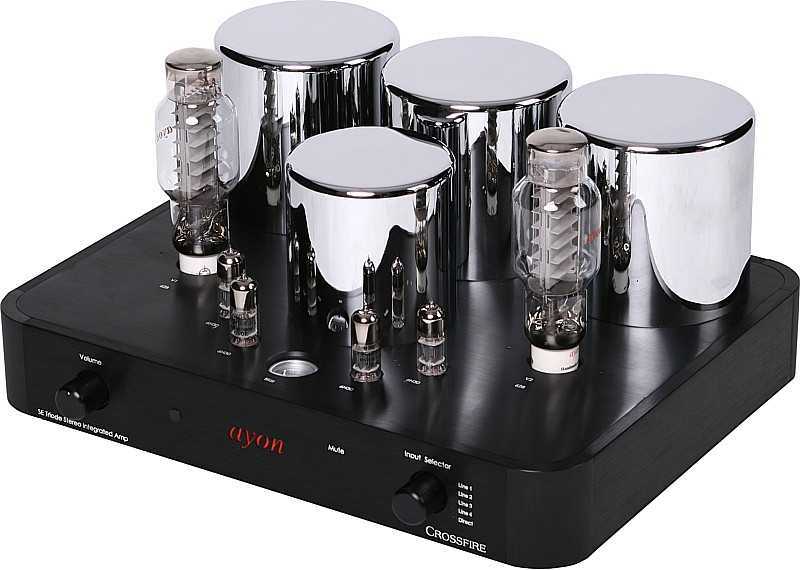 These valves, as already stated, are only available as service items to Ayon owners, and at a price of 350 Euro. 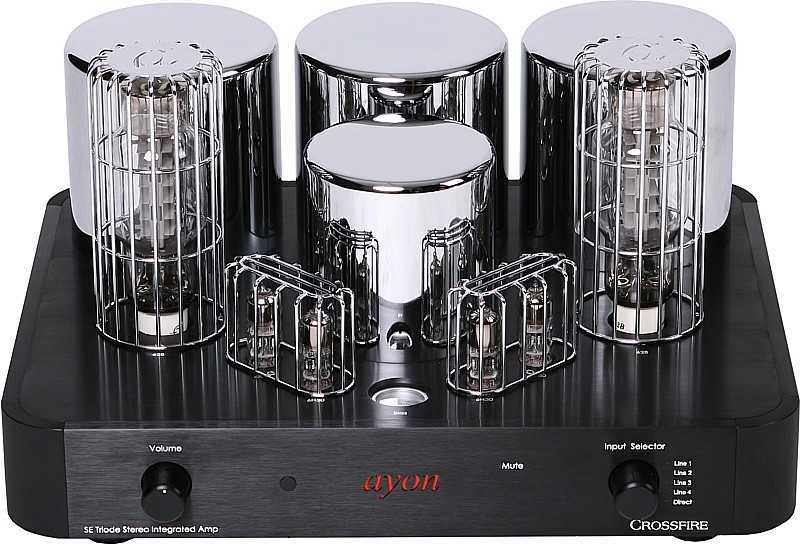 Ayon apologised that they were so expensive, but in my opinion they are better made than most of the boutique 300bs which command similar prices, and produce more power than pairs 300b's. The other thing I like about these valves is that Ayon have great confidence in their longevity. The '62's come with a 12 month guarantee, a failed valve being replaced by a pair of new valves free of charge. If in the second year a valve fails, the pair are replaced for the cost of a single valve - very impressive, but not as generous as it sounds, because to date Ayon tell me they have yet to have a failure! To put that in perspective, my Opera PSE's ate a set of two matched pairs of Full-Music 300b mesh plates in just over 12 months at a cost of about 700 Euro, and few manufacturers extent valve guarentees past 3 months. 1 - The on/off switch is next to the IEC socket, at the back of the amp. Unless you have full access to the back you will end up with singed arms ever time you reach back to switch the thing off. Now I know that most people recommend that such amps are kept on all the time, for both sonic and for the life of the valves, but in this day-and-age burning a few hundred watts for no good reason isn't really where it's at. The amp chucks out a lot of heat as well, great in winter but in summer a bind. 2 - The control knobs are beautiful lumps of alloy, but their movement is very stiff, not helped by their small diameter reducing leverage. I frequently found myself trying to move the selector beyond the first position (i.e. against it's stop) because it required quite a lot of force to clunk between inputs and this, added to slack in the system, meant I was never really sure where the selector was without bending down and looking carefully. It's a minor point, but it was the first time that the magic of using a beautiful, perfect piece of machined engineering was broken. With my own Audionote/Opera combination the background noise is a hiss and slight hum - it's enough to irritate my wife when I'm not playing music, but no worse than any other valve pre/power I've had here. And because the power-amps are in effect flat-out waiting for the signal then there's no way of getting rid of this background. Examples? You want examples? Well you've read my eulogising of the 'King James' album, well if ever there was an amp made to demolish your back wall and insert the Wylie Chapel and a big band in the hole then this is it. I'm not (I think) talking about extra detail, new tunes, massive soundstage - though it has all that - but simply the opening of a window, I honestly cannot think of a better, and less cliche'd description. I took a valve pre-amp I have here and played it into the Lehmann Stamp digital power amp - sheeeesh it sounds so grey! It improved once warm, but this fine little amp, the best of the digital breed just seems to lay a slightly grubby layer over everything - a dull putty filled the spaces between instruments where before there had been nothing - nothing at all... True the Stamp costs a fraction of the Ayon but the total cost including the pre-amp was close.